Super 8 is a 13-track (44 min, 03 sec) collection that fuses nu disco, deep house, and Synapson's trademark electro sound. 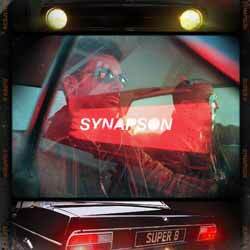 Formed in 2009, Synapson is comprised of French multi-instrumentalists Alexandre Chiere (keyboard, saxophone, beat and vocals) and Paul Cucuron (drums, scratch, record production and mixing). The duo are best known for their remake of Burkinabé singer-songwriter and musician Victor Démé song 'Djôn'maya' renamed 'Djon Maya Maï' and their original track 'All In You' featuring Anna Kova. Both tracks charted in France at #12 and #10 respectively and are included in Synapson's last album Convergence. Super 8 is the perfect album to kick off the weekend with. Getting ready to go out? Put this on, loud, to get you in the mood for a night on the town. There's a nice balance of tracks here, from their house-funk infused single 'Hide Away' (feat. Holly) to ‘Souba’, which has a crisp Gallic style matched against a subtle Latin element in the percussion.